Working life is full of fullness! I was talking to a friend today over “coffee” (I had chai tea and she had lemonade, actually, but we will still call it “coffee” because I can’t think of anything better right now) about the challenges of working a non-specific schedule. I had had all these plans to organize the whole house this week, but got called in to substitute three half days this week in Kindergarten-land (which is more tiring than a whole day of other grades, let me tell you). It was good to get back to work, as I didn’t work at all in December, but it was still hard because I’d had all these mental plans and didn’t get to most of them. The closet of doom. I don’t know if those clothes down there at the bottom are dirty or clean. I sorted everything into categories: Rocks, Office, Ships game, Lego instructions, Nerf Darts, Things Which Do Not Belong To Me, etc. Again with the Flylady process. I filled everything at least once and took it out. The trash went out three times. The bookshelves now hold books! They’re not organized yet, but they are all on there now. 🙂 And no, I have no idea why he’s collecting root beer & cream soda bottles. None. 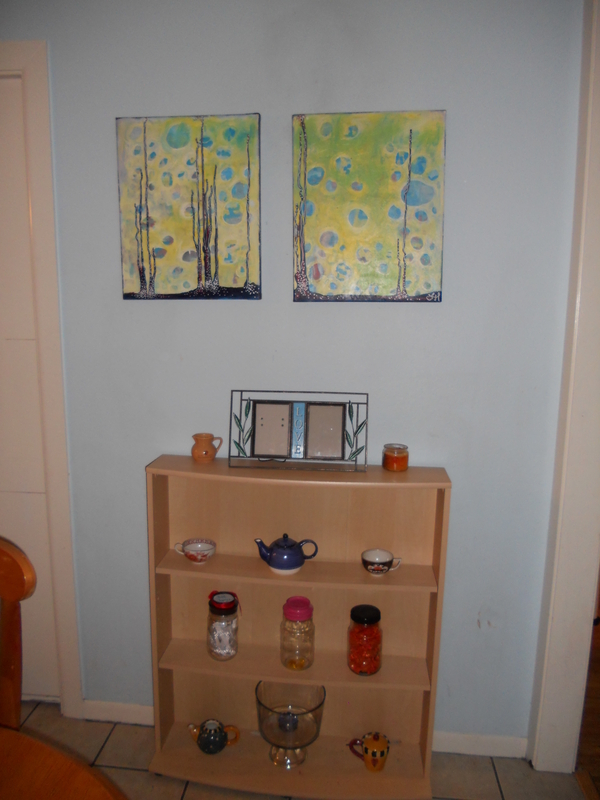 I put up the art he brought home from Art Camp (his teacher sketched these). 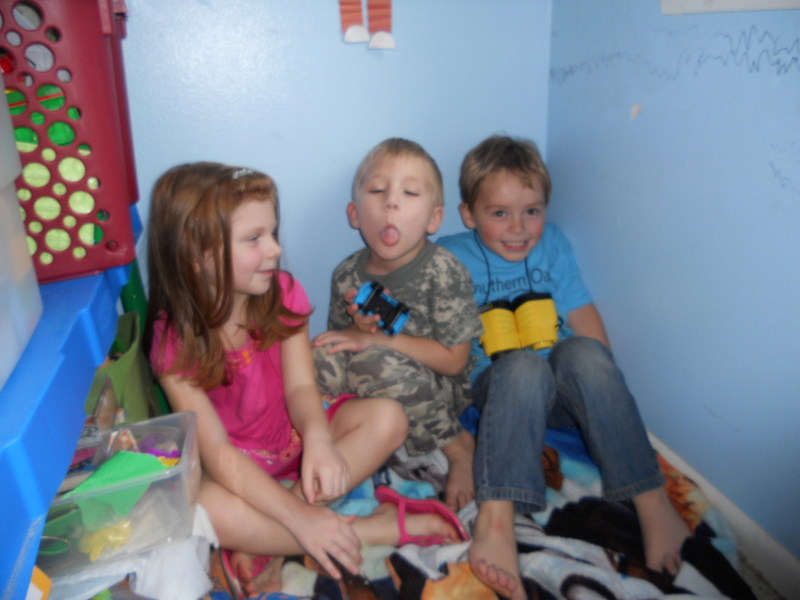 They’ve lived in a pile on the floor since July. I found school work in EVERY SINGLE DRAWER. No wonder he never can find anything. I bought him an expanding file, sorted his work into classes, and have sent him off to make labels and shove things into the sections. Now that he has been taught to use it he has no excuse not to be organized. Drawers labeled: Small Toys, Lego Instructions, Memory Stuff, Organized bits of Lego, Office supplies, School stuff, Art supplies. A place for everything and everything in its place, part two. As you know, I go crazy in January and start cleaning and organizing everything in sight. I don’t know why. Maybe it’s the cold, rainy weather. Yesterday I tackled my hallway bathroom closet, which I guess could also be called my linen closet. Okay, so it doesn’t look quite so bad as my brain says it does, but it was making me crazy. There’s a method to the madness. One box is labeled “Another Room,” one is “Keep,” one is “Donate,” and one is “Toss.” The “Keep” box is the giant pile in the middle. Done! I filled one of each other above labeled boxes (except “Keep” which was the stuff that went back in). I took this photo before I labeled the shelves, but they are labeled by what’s in each bin. Secret surprise if you look in my linen closet: preschool graduation photos of each of my kids! Today I’m tackling David’s room as part of my Flylady plan. It won’t be done in 15 minutes for sure, but today the desk is getting organized. I’ve been at it an hour now and it’s finally empty. I’ve filled one trash can, one keep box, and one another-room box already. Now I can see why he can’t ever find his school papers. There were a few papers in each messy drawer. AIE! Today we got up, late, as is the course of things this week. Today it caused a bit of panic. I needed to have gotten up early to tidy for the babysitter, who was coming in unreasonably early to watch the boys while I got my RA infusion. I went out to pick up donuts while 2/3rds of the kids were asleep, but I couldn’t find my debit card once I got there, so I came home empty handed and dreading identity theft and called around to make sure that wasn’t the case and made a quick casserole, which no one really ate. Had my infusion, which was awkward due to several issues, and came home and “rested” which means got-crawled-on-by-boys-while-playing-on-facebook-and-reading-to-boys-and-feeding-them-occasionally. Whee! Nick eventually came home and we got things ready for church tomorrow and ate dinner. Now everyone is asleep except for me and Greg. He says he’s having nightmares. Ha. He hasn’t slept a full night in his own bed (it’s like musical beds around here) since Halloween, not that I blame him. I haven’t slept or had a crying-free day since his friend’s mom (my friend Jelena) was murdered and her brother kidnapped either. We should probably seek therapy or something. I just keep telling myself that it could be worse and that really I should get over it. It’s not that easy, though. I’ve been writing sad poetry again. That seems to help. I guess 6-year-olds don’t really do sad poetry. They sleep with their mamas. Ah well. I’ve run out of things to say today. Good night, people! Yesterday my little family took a tour of the house and looked around. I mean REALLY looked at things: the socks on the floors, the fingerprints on the walls, the dishes on the coffee table, the unmade beds, etc, etc. My resolution this year is simply to take a bit better care of myself. To choose ME this year instead of others more often. Because I haven’t done that in a long time and when I look at myself and pay attention, I see that I am another year older, another 20 pounds heavier, and stressed out beyond belief. So I’m going to just be good to myself this year and see where that takes me. 🙂 My best friend mentioned that I need to break that down into a list of Things To Do, so I can check things off at years-end, which is not something I’m very good at remembering to do. In fact, looking back, I fulfilled NONE of mine this year and didn’t appear to make any resolutions at all the several years before that (at least on the computer. I might’ve on paper, now that I’m thinking about it). 1. Exercise a couple or three times a week. This can include, but is not limited to: walking, swimming, yoga, some kind of Wii sports, whatever gets my heart rate up, actually. 3. Investigate the idea of going back to school to be a media specialist for schools. I’ve been asked about doing that a lot lately and while I don’t know if I am interested enough yet to go through with going back to school, I’d at least like to look into it. 4. Plan our trip to the UK. Go there. Enjoy ourselves as a couple, rather than as parents. 5. Date my husband more this year. By more, I mean at least once a month go somewhere not chore related on our own and smile at each other. Whee! 6. There is no #6. 7. Figure out a better daily schedule, so each day doesn’t feel like a crisis situation. 8. Pay attention to what I’m eating and drinking so I don’t eat a billion pieces of chocolate or all the french onion dip in just two sittings. I don’t know how to make this one quantifiable yet, as the last two programs I tried that kept track of that stressed me out more than helped me. 9. Scale back on my internet time somehow. I think this will involve dropping some of my newsreader subscriptions and the facebook friends I am not terribly close to will go to unchecked for updates. I’m also turning off a bunch of notifications, as I spend half my time these days seeing double updates, as facebook sends them to my inbox and the phone posts them twice. So that will be done, too. For Day 11 I tackled the biggest boys bedroom. I don’t have any DURING photos. I was too busy being busy. And now for an explanation of my process. A real life friend asked today how I manage to do all that I do. Here’s how: when I move furniture I take everything out of it. Then I take it as far apart as it goes, unscrewing screws, taking off drawers, legs, anything to make it lighter. Yes, this is time consuming. Yes, it’s tedious. Yes, I probably ought to ask my husband to move stuff for me. But then he’d have to stand around while I internally debated all the pros and cons of where I wanted the item to end up and move the parts back and forth and back and forth while I decided and let’s face it: that would make him insane. I’m trying to avoid insane Nick. Also of note, I didn’t do this room in an hour or even two. I started on it right after I dropped big kids off at school around 7:30am and worked on it off and on, with frequent rest breaks and time off to take Greg to school and to eat meals, until 1:30pm. Here, for instance, those plastic drawers: mostly empty. Also: lightweight. They’re living in the garage awaiting a trip to another home. There was a little plastic cart in the corner you can’t see that just wheeled on out (also mostly empty, oddly enough). That all got moved the first 15 minutes, then a fifteen minute break. The file cabinets got emptied out (each one had one empty drawer already). The top one had drawers that came all the way out, the bottom one did not, but I already knew that (that’s how they came to be stacked that way). I only moved them a few feet across the room to hold up the desktop (which, don’t tell David, was the bottom of his crib) of D’s new desk area. I moved those one at a time, with a rest break in between and afterward. Also in between everything was the ever-present picking up of Lego bricks. They’re EVERYWHERE (they were even, mind-bogglingly, under my bed). The closet of joy and emptiness. Or NOT. I found 12 belts in there. 12. He can’t ever complain about a lack of belts again. A couple weeks ago I realized that a friend I rarely see these days was posting a lot about not having time to finish her work projects and that her son was really lonely. I made a few small overatures of “Hey, send that kid my way” by text message, but heard nothing back. Then a couple days ago we ran into her son at the bagel place and he attacked hugged my son and dragged him all over the place clinging to him. His mom wasn’t with him, but his grandmother relayed the story and later I got a FB message asking if I was at all interested in babysitting. So yesterday I took my big kids to school & headed over to her house to see about making arrangements. 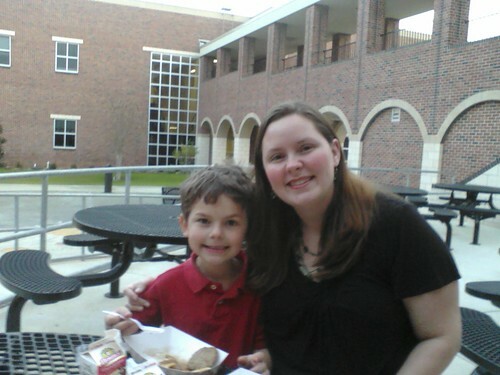 It boiled down to me taking her son about four hours a day, twice a week, on our non-MDO days. He and my son get along famously, so it’s not much more than a couple overly-long playdates a week. In exchange I get nifty art for my wall and art lessons for my boys once the holidays are over. I think it’s an awesome trade, so I said yes. So the two moms show up in my driveway at the same time (which wasn’t part of the plan). The spare boy was devastated to have to go home now that there was a new kid to play with. 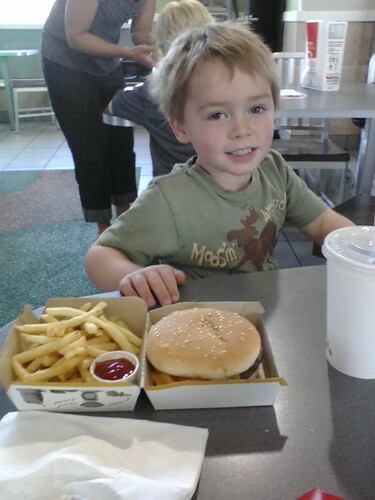 He didn’t tantrum, he just quietly balled up and cried, so I caved and kept both kids for the afternoon. Play with three kids was different than with two. Greg and K. would have played house and grocery store and restaurant. With A. there, they had weird competitions and poured water all over the construction kit. It was…not optimal. K. came inside for “alone time” for a while and I built her a curtain for the reading nook (an adult can see straight in from above, but kid sized people cannot – perfect). The boys were sad that they’d made her need alone time and made rules for further play, such as “no competitions, no slamming doors, K. gets alone time because she’s a girl, and no water in the bedroom because we’ll put it places it doesn’t belong.” Greg picked flowers from the backyard and gave them to her. Things went well after that. 🙂 I got a couple loads of laundry done before snacktime and then we got everyone off to their own houses. Of course the day didn’t end there. After that I had to take all of my kids to the store to buy supplies for the box car derby. Then come home and make dinner (it was my night). Then drive kids to/from scouts. And then after all that, time to work on PTA stuff. What a day. It was exhausting. The sad thing is, other than having two extra (and super nice) kids, it wasn’t that different from a regular day. 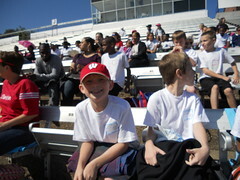 November 15, 2011 Lisa H.
It was David’s Track & Field Day. 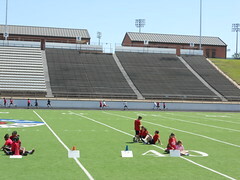 This year the 4th & 5th graders got to have a big track meet with some of the other elementary schools over at Rose Stadium (the big one the two high schools use). I was only going to go for the first half, but David didn’t have a whole lot going on during that time period, so I stayed til the end. It was a big disappointment for him: he followed directions and didn’t get a chance to play any games because none of the other kids were following instructions. Tuesday afternoon they watched some more Airbender (as I call it. Avatar, as they call it). 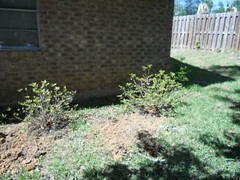 Greg and I dug holes for the azaleas that had magically appeared in our front yard. 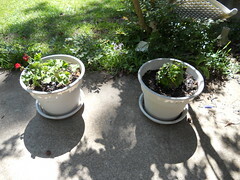 We planted & watered them. The brothers had to be pried out of their seats to go to piano lessons. Thursday was the Day that Wouldn’t End. There were no toaster pastries left when we got up, which I had promised as a special treat (Nick didn’t know that David had eaten his already, so he thought he was saving me from fighting kids by eating the last two), so we had to go to the grocery store before school. Eventually got everyone to school, but then I had 10,000 errands to run and none of them went exactly as planned (mostly the scout related ones, naturally). I did manage to buy everything needed (I went to the grocery twice and Wal-mart as well) and got back homewards just in time to pick kids up from school. 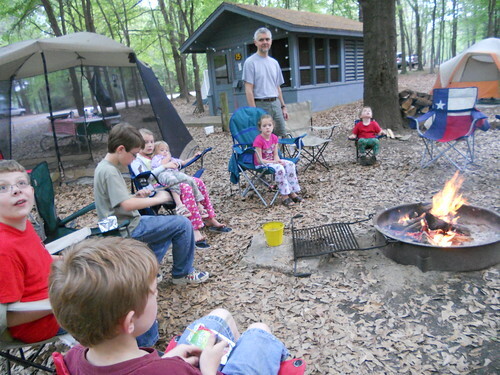 Of course then the kids had kids with them, which I’d invited and everything, but had forgotten about having over. So the house was a wreck, people were coming over, I had no snacks (despite all the grocery runs), and there was chaos. Which is when my mom called to say that the main city water line had broken outside of their house; water was everywhere and they couldn’t leave to come up here because they were blocked in my giant bulldozers. I couldn’t do anything for her, but for us, all was not lost: we had water balloons and Junk Trail Mix (saving money/parenting tip: if you have a houseful of kids, no “real” snacks on hand, but lots of leftover holiday junk food, combine the whole thing in a bowl, toss, then dish out as “Junk Trail Mix” The children will devour it, think you’re the funnest parent ever, and you will have saved money by not shelling out for “real” snacks). 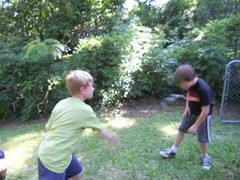 The water balloons saved the day and there was much fun wetness. We filled up fifty balloons, split up into three teams, and picked our bases. The big kids took the jungle gym, the medium kids took the trampoline, and me & Greg took the comfy chair (there really were only two bases that were decent choices, alas). 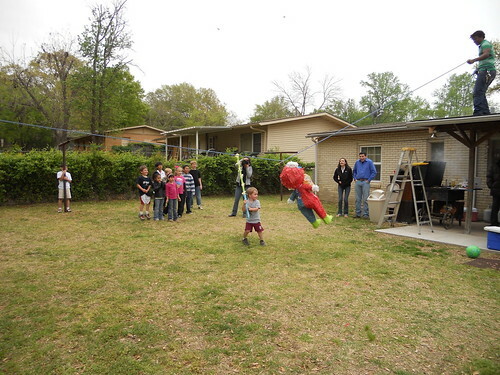 The big kids were very sneaky and let the younger kids throw all their balloons before pelting them from above. We also noticed that throwing balloons up there did no good, as they bounced on the wood and did not explode, so that gave the big kids more ammo to pelt us with. After the filled balloons were gone, I went inside to check the camera and the kids started filling more balloons, but not tying them off. 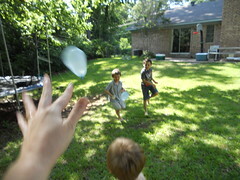 They figured out that they could be twisted and thrown with all the watery splash and none of the broken balloon pieces, as long as they were throwing short range. They also kept trying to lure me outside to get me wet: a cute kid looking sad at the door while two to the side were armed with balloons waiting to pelt me when I opened the door. After everyone went back to their homes, we grabbed a quick dinner before Nick and David left for Webelo scouts. Today is Friday and my parents are on their way up. We’ll spend the afternoon with them, then hit somewhere fun for an early Mother’s Day celebration, since our Saturday is filled with church stuff and they’re going home early Sunday morning. May 6, 2011 Lisa H.
I’ve gotten fairly good at putting things off lately, like this blog post. I was going to start it on Monday last week, but the pictures weren’t up yet, so I was waiting on that. Then when I finally posted the photos, I realized that I had 101 other things to do, so I did those first. At some point so much time had past that I thought, enh, why bother. But yesterday I complained to a friend that she hadn’t updated her blog lately and her responses were so close to mine for not blogging that I laughed long and loud. So here I am, blogging. Yay. The next-to-last week of March was busy, but that’s really normal these days, right? 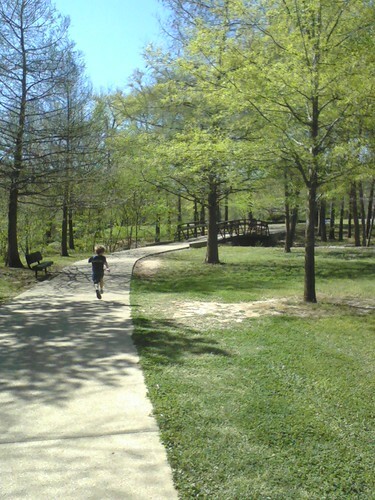 Greg and I did a lot of stuff with the school, but we also had some fun time on our own, going to the big park on the south side of town and walking some of the trails & bridges, then playing afterwards, and also going to the McDonald’s with the fun play area (using coupons a friend gave us). I also got to visit my favorite local baby and her mama for an afternoon. It was Texas Public Schools Week, so our PTA did Muffins for Moms one day, Pancakes with Parents another, Donuts for Dads a third day, and also a program with the 1st & 2nd graders. 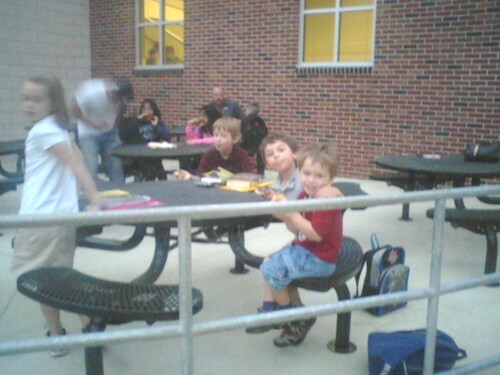 Since I’m one of the PTA volunteer regulars, I went up each day and helped out with various things. We had a bit of a kerfluffle, due to some miscommunication about what the events really entailed (the muffins & donuts were for parents ONLY, due to some bizarre regulations about offering kids free food at a competing time a federally sponsored free food program was being offered) and a lot of parents and kids went away from what was supposed to be a positive event with bad feelings in their hearts, which made me really sad. (Also, I had baked 9 dozen mini muffins for the event and had to take most of them back home with me.) One good thing, though, was getting to tour all the new library books the school ordered from the last of their grant. So many beautiful books! Also, both of my kids won door prizes from my having gone (one new book each!). The 1st and 2nd grade program was nothing but pure delight, though. 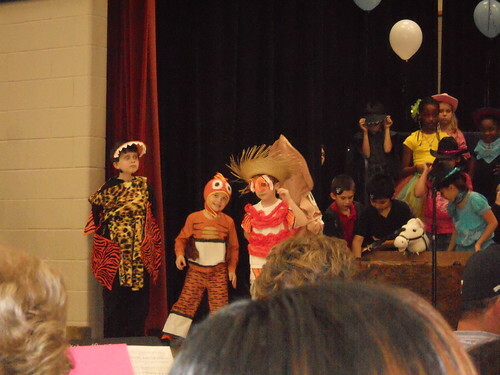 Ben was a soloist (one of 6, but only he and one other girl had really long parts), and an actor (clownfish #3), as well as singing and dancing with the rest of the kids. We had to make him a clownfish costume (most of the other parts there were costumes already made up for, but the clownfish were on their own, costume-wise) and he looked really really cute. 🙂 He did a great job singing, dancing, and acting. Afterward, Pa took us out to dinner at Taco Bell while Nana skeddaddled off to teach her class (which she’d postponed an hour for us: so thanks to her and her students!). The next day we spent getting ready to go camping. 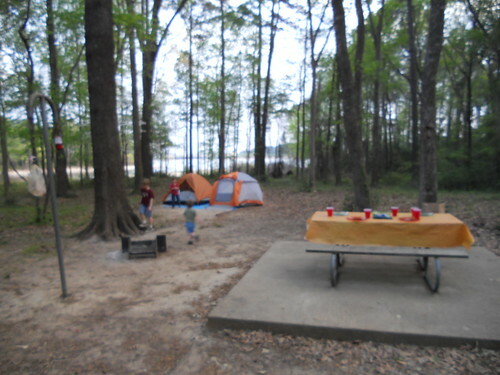 We picked up the boys from school and headed on over to Martin Creek Lake State Park and spent the weekend camping with some of our friends from church. 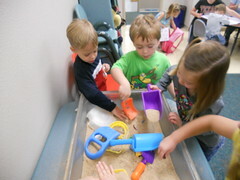 Most of the kids from church were there, so the kids had a blast. 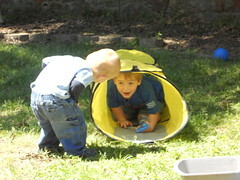 David got to spend both night in the Boys Tent (the other kids stayed with us). 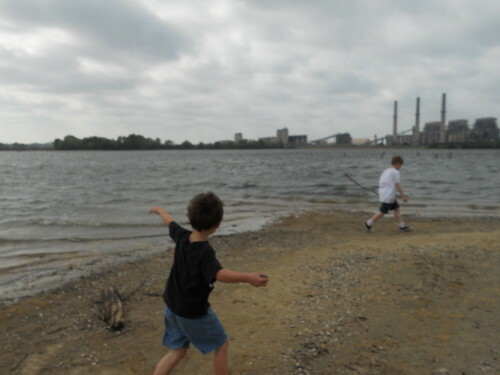 We took the kids on nature walks around the lake and got to see an electric plant up close. It was really windy on that side of the lake and it made the waves and wood really interesting. The lake was quite a lot down on water as well, so there were lots of shells everywhere. We collected a bunch of pretty ones to take home. We had a church service in one of the open air cabins, listening to the sermon from our regular service over the internet (lovelovelove technology) while the kids made crafts at our feet. It was a really nice weekend. Entire photo set can be found here. April 7, 2011 Lisa H.
Dude, this chopper thingie really rocks. It’s one of those slidy things with a blade on one side (diagonally set) and the other side has a place for different shaped pieces to slide in, depending on what kind of cut you want. It took me 30 seconds to cut carrots, instead of the 5 solid minutes of work it would have taken me for horrible slices. Alas, I did suffer one small problem: I sliced my thumb. Oh well. All in the name of making inexpensive baby food.